You may have noticed that I was a bit absent from the blog the last 10 days and the reason for that was a critical hardware failiure of my work laptop, so I’ve had to get a new one install it and recover all the data and backups to it… and it took me some time, but now everything is back to normal. But more importantly, I was again looking for some portable laptops with 3D-capabilities, something that I’ve talked about not too long ago here on the blog. This time my idea was to actually get a portable 12 or 13 inch 3D-capable laptop with a 3D display, not a gaming solution, but something that can be used to preview 3D photos and 3D videos and of course to do some testing of different stereo 3D software on it as well. Unfortunately I still could not find a good solution that fits my requirements, probably they are too specific, or I’m in need of something that is still considered a way too niche product for anyone to make it. So in the end I’ve ended up getting a good 2D laptop, namely the HP EliteBook 2560p – a great portable, yet very powerful and feature rich system that pretty much offers all that I need, minus the stereoscopic 3D support. 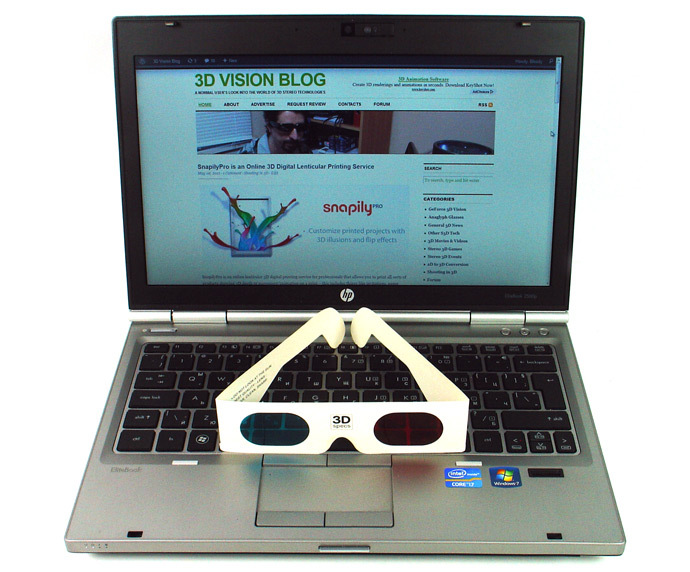 So again a pair of anaglyph 3D glasses gets packed in my laptop back for use whenever I need to preview something in stereo 3D or test something and I don’t have my stereoscopic 3D-capable desktop test systems available. Maybe I’ll have more luck the next time I’m replacing my laptop… hopefully by then there will be more 3D-capable portable solutions actually available on the market. For now most 3D-capable laptops are intended for gaming or multimedia use and go with a larger display size and powerful discrete graphics, instead of being designed for stereoscopic 3D use on the go… and we actually need a bit more diversity.